San Antonio Central Catholic boys scored 51 for the team title, ahead of Nolan Catholic with 78. St Pius X sr Joey D’Eramo clocked 16:00.0 for individual honors, matching his 2006 win, followed by Austin St Michael soph Dennis Hodapp in 16:32.9. Nolan Catholic girls struck gold with 45 points (3-6-8-10-18) and a 12:54 average, while defending champ Ursuline earned silver with 57 and St Agnes took the bronze with 81. 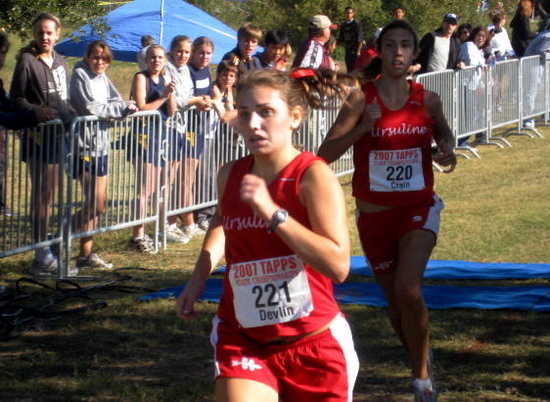 Ursuline sr Katherine Devlin broke the tape in 12:12.2, moving up from 4th place last year. Ursuline sr Natalie Crain, a newcomer to cross country, but a 3-time winner of TAPPS track 400 meter title, was just a few ticks back at 12:12.9, with Nolan Catholic sr Allison Flood 3rd in 12:26.1. Corpus Christi Incarnate Word boys and San Antonio St Anthony were 1-2 again this year, scoring 75 and 110 respectively. Dallas First Baptist jr Micah Dettmer led the field in 16:37.3, with San Antonio Christian soph Peter Martin his nearest pursuer in 16:42.2. Awty International girls, the 2006 runner-up, had 4 in the top 10 on its way to the team trophy with 39 points, followed by San Antonio Christian with 102 and Gorman with 136. Gorman sr Mia Behm successfully defended her title, zipping around the course in 12:05.2. Awty sr Sophie Peters took 2nd in 12:19.7. Ovilla Christian boys tallied 67 for the team title, followed by Grapevine Faith with 78, the same places they finished in 2006. Grapevine Faith sr Austin Bracy, last year’s bronze medalist and the top returnee, crossed the finish line in 17:33.4, ahead of teammate Andrew Hale in 17:39.4 and Ovilla Christian’s Kevin Frost 17:40.6 to round out the top three. Ovilla Christian girls also took home gold as they had last year, scoring 41 (1-4-7-12-17) to finish ahead of Austin Regents with 52 and Reicher Catholic with 75. Ovila Christian jr Ginny Murphy outran the competition, clocking 13:06.3, followed by Austin Regents sr Taylor Hale in 13:19.2.